Killed in Action on 17 May 1918 during the battle of Awely Wood, aged 25 years. 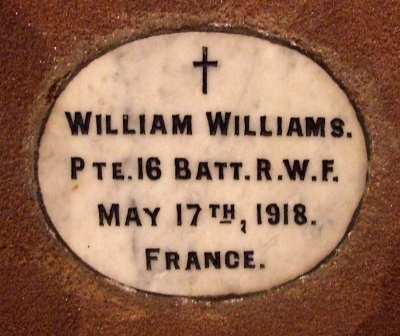 William Williams was born in Holywell, Flintshire during 1893. The 1911 Census states that the family resided at 1 St. Winifred’s Terrace, New Road, Holywell. The head of the family was Thomas Williams aged 49, a Colliery Hewer. His wife Rebecca Williams aged 46 and their three sons, Thomas Williams aged 23, a Labourer, Mesech Williams aged 20, a Shop Assistant and William Williams aged 18, a General Labourer. Mesech, William’s elder brother was killed during the First World War and his name also appears on the Holywell War Memorial. Photograph taken on Sunday 9 April 2017 by Geoffrey Mitchell who placed a British Legion Wooden Remembrance Cross on William’s grave on behalf of Flintshire War Memorials. There is a Flintshire Roll of Honour card for William Williams at the County Archives Office, Hawarden. 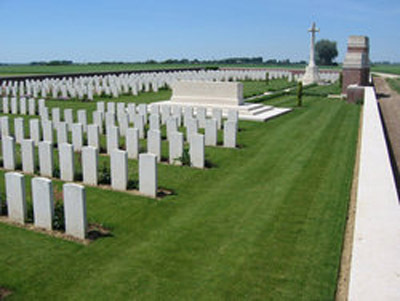 Details of his medals were obtained from www.forces-war-records.co.uk.